Debut author, Army veteran, wife and mother Heidi Radkiewicz was never meant to be your average blushing bride. While she did spend her honeymoon amidst palm trees, they were not set in the backdrop of any tropical paradise, as within weeks of saying, “I do,” Radkiewicz was deployed to Iraq alongside her loving husband Jake. 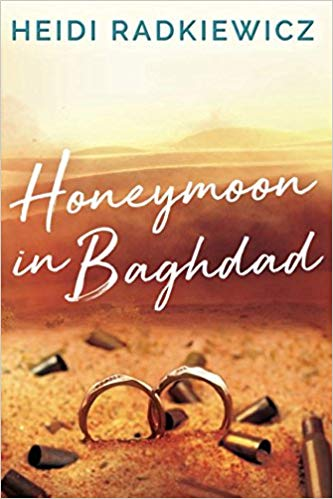 Written with grace and humor, Honeymoon in Baghdad shares Radkiewicz’s inspirational and charming coming of age story, from growing up in rural Iowa to being deployed to Iraq in the same platoon as her new husband. During the early days of the Iraq war, this couple faced combat together head-on, tackling the unique challenges and joys of a new marriage beset by the horrors of war. In the months that followed, intense heat, mind-numbing boredom, and the ever-present danger of roadside bombs and murderous insurgents forged this pair into a team that can take on the world. Radkiewicz’s account of this formative period in her young marriage is a lesson in the unwavering power of faith, hope, and finding joy in unexpected places. From bucket showers to palm-sized water beetles, Heidi’s message is clear: hold tight to the people you love, take comfort in the man by your side, and keep a look out for anything that can make you smile. And through the grace of God, adversity can pull you closer together. Army Veteran Heidi Radkiewicz was born and raised in rural Iowa and now resides in the Chicago area where she is a stay at home mother and wife. She enjoys taking care of her family, working out, health and nutrition, having fun with her Belgian Malinois, reading up on politics, and traveling around the country with her family in their RV. This entry was posted in Award, celebrity, honoree, India, Recognition, women and tagged author, Baghdad, Heidi Radkiewicz, Honeymoon, love, marriage, military, relationship, Today's Honoree, veteran, war. Bookmark the permalink.